A large plate showing Talarocrinus patei crinoids of the early Carboniferous Period found in Kentucky. This plate is on display at the Smithsonian Museum of Natural History (as of August 2010). Their collections database shows a specimen of this species named by Miller & Gurley. 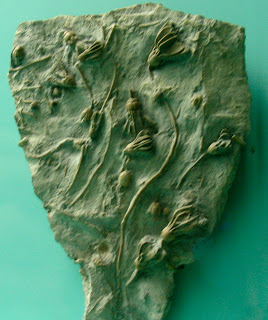 It identifies the location as Breckinridge County, Kentucky and the specimen of the Upper/Late Mississippian Period. It was found in the Chester Group of the Ohara Limestone Formation. The time periods do not match with the specimen pictured so it must be a different specimen.